This is a collection of Aunt Julies friends and family recipes. 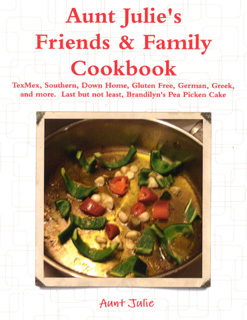 Tex Mex, Gluten Free, casseroles, dips, soup, chili, and other favorites. Simple and very easy. 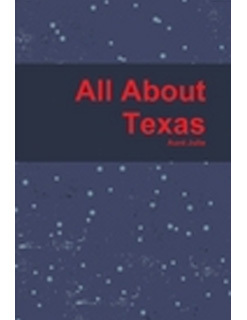 This book is about Texas History, Texas Independence, and the early settlers to Texas. An introduction about missions, Texas Rangers, and the brave people that came to Texas for a new life. Immerse yourself in nutrition and make healthy choices. Fat Burning Foods 6 Flat Belly Foods 20 Super Foods For Weight Loss 5 Healthiest Fat Burning Foods Rev Up Metabolism Negative Calorie Food Anti-inflammatory Foods Pro-inflammatory Foods Longevity and Anti-Aging Foods Natural Diuretic Boost Immunity & Brain Booster This book is for information on my journey to health and weight loss. See your doctor before starting any health or weight loss plan. My mother, my four sisters, and I have been dieting for years. They all work. Eat healthy, exercise, and watch your portions. 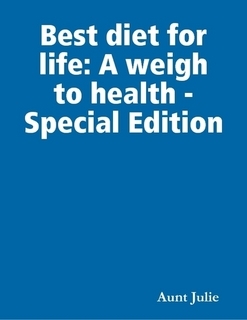 I realized that all the diets and everything I have read took me back to the basics. Everything I learned in school about a balanced nutritious meal is what I have to do every day. Doing this brings about weight loss, health, and energy. Eat Healthy, Feel Better, and Live Longer. It is a constant battle and something we have to be aware of daily. Good Luck and God Bless! 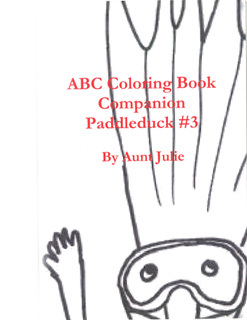 This is a companion-coloring book to ABC Paddleduck #3. The children that participated in the artwork did a wonderful job. I am so thankful for their contribution. I hope everyone enjoys reading and coloring the pictures. 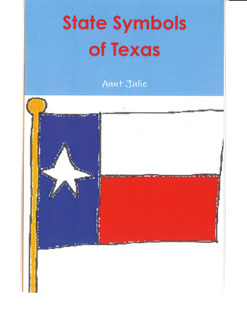 Aunt Julie was born and raised in Houston, Texas. Paddleduck nickname was given to Julie when she was a child. Her grandfather thought she looked like a duck paddling in the water when she went swimming. He called her, "Paddleduck". Julie has four sisters (Kathy, Ellen, Cindy, Carolyn) and nine nieces and nephews. 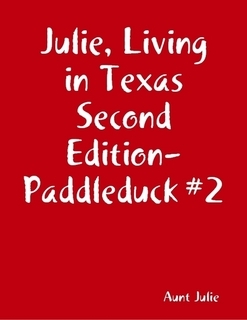 Paddleduck Julie presents a delightful look at a carefree childhood in Texas. This is a wonderful collection of short stories for grownups to laugh and children to be amazed. This storybook shares the joys, surprises, and enthusiasm of being a child through the eyes of a little girl who loves to have fun. Stories includes tales about her friends, classmates, neighbors, family, and sisters—Kathy, Ellen, Cindy, and Carolyn. Come follow Paddleduck Julie as she goes on a fishing excursion, meets a bird named Ronnie, takes a trip to the farmers’ market,horses for sale, alligators,a hornet,an elephant with the Girl Scouts,a birthday party, and a day at Galveston beach with New York cousins. Celebrate the fun and excitement of being young. This book is intended for young readers and young at heart. Paddleduck Julie tells stories of a child growing up in Texas. Readers of all ages can relate with Julie's stories about youth and the people around her.Julie shares the enthusiasm, joys and excitement of childhood. 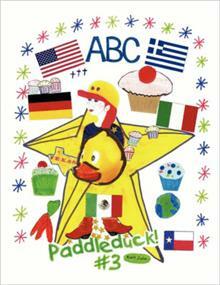 Follow Julie, a little girl from Texas, through the animated story of Paddleduck. Julie’s stories include family, friends, and classmates; in everyday life. Paddleduck is an adventurous and mischievous little girl who likes to have fun. Through a series of lively short stories, we will follow Julie (Paddleduck) as she goes to school, gets a new pet, is visited by the tooth fairy, enjoys holidays with her family, celebrates her birthday, and teaches her ninety-five-year-old grandmother how to use a computer. Her nickname is Paddleduck because her grandfather said she looked like a duck paddling in the water when she went swimming. Aunt Julie taught Sunday School for 20 years at First Baptist Church Houston. She grew up at Langwood Baptist Church. 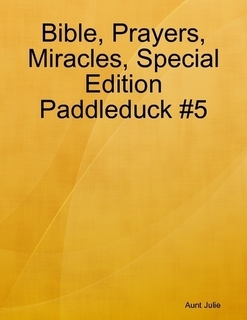 This is a collection of bible verses, songs, Bible facts, Bible Trivia, Pledge of Allegiance, puzzles, miracles, and more. This book is 6 x 9 with b/w interior. ABC Book for children learning to read. 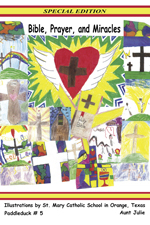 Colorful pictures inside by children. Translation in English, Greek, Spanish, German, Italian. Learn the language of your ancestors. Just when you think you read all about Julie, A Little Girl From Texas, there is more. Julie went swimming and her Grandfather said she looked like a duck paddling in the water. He called her, "Paddleduck". Paddleduck Julie also loved to jump off the diving board. Her friend Tama did belly busters. Paddleduck talks about Ashley and Kendall, when she cooked her roast it looked like a log and when she fried her chicken, it looked boiled. Paddleduck tells about her summer in San Antonio, smelly feet of Uncle Albert, the family picnic and she remembers the, Alamo. Her cousin Allison and Jean visit from New York and Ginnye, their driver, gets a speeding ticket on the way to the beach. Paddleduck sees Ms. Kandy with two men in white space suits. Honey Bees? A bird named, Ronnie, knocked on the window and said, yee-ha. At a birthday party for Vicki, someone hid onions in a hot dog for Kelly and the cupcakes had a bite taken out, Rhonda had chocolate on her face. The Girl Scouts went on a trip to Busch Gardens and they rode a sweet elephant named, Alma. At the YMCA, Peggy told Darlene not to go near the alligators. See what happens when she does. Aron and Andie feed the goats they named, Dougy and Holdy. Did they see a ghost? Jessica and her dog, Baby, eating hamburgers, a snoopy cat named Little Debbie, and more. Enjoy as Paddleduck Julie shares her lively childhood stories! 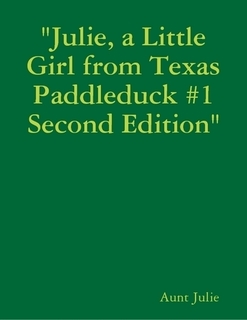 Paddleduck Julie is a little girl from Texas. This new release is a children's book for young readers and the young at heart. 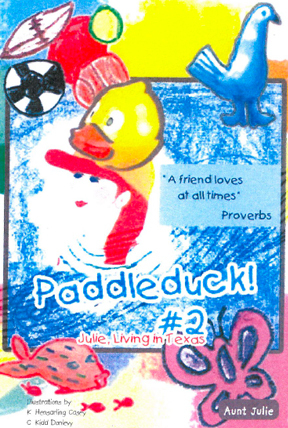 The story of Paddleduck Julie is one that shares the enthusiasm, joys and excitement of being a child. 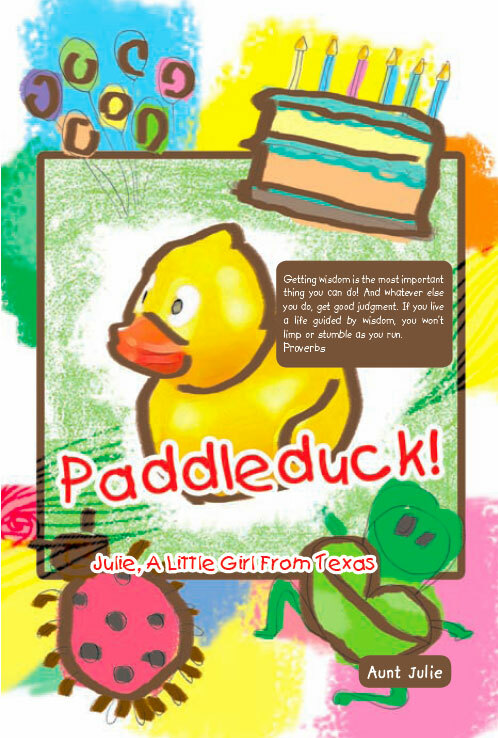 Follow Julie, a little girl from Texas, through the animated story of Paddleduck. This collection of short stories covers family, friends, and classmates; fascinating tales readers can relate to and interesting characters to identify with in everyday life. Readers of Aunt Julie have given this newly popular first time author raving reviews, and she is considered a bestseller in children’s books. Read all about Paddleduck! Julie, a little girl growing up in Texas.